Answer Me This! Did you know my friends wrote a book? 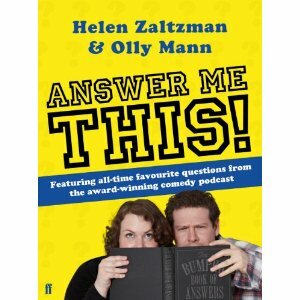 My pals and podcasting cousins Helen Zaltzman and Olly Mann have written a book based on their internet show Answer Me This!, and I have a received an early copy, and can report that it looks brilliant. H&O are properly famous in the podcasting community (and beyond). So slick, funny and original is their show that it comes decorated with prizes and merchandise, and is always charting high on iTunes. The format is quite simple: they answer questions sent in by the public, often assisted by the echoey voice of ‘Martin the sound man’ (Helen’s lovely fiance). They do a bit of research into the answers, and you might learn something, but the real joy is in the fresh and unpredictable banter sparked by the listeners’ queries. The questions are often funny, but the answers always are. I feel spiritually close to Helen and Olly. I’ve interviewed them twice – once for my internet magazine, and once for Shift Run Stop. We’ve all done podcasts, we’ve all been made up like cockatiels by the same make-up artist for the same spot on Sky news, and now we’ve all done books! They’re better than me, of course, and they have proper agents and real publishers and everything, but Helen stills hangs out with me a bit and lets me pretend I’m on her level. She is just so unbelievably funny, creative and genuine. She’s also very good at details, and was the first (and possibly last) person to read my book. All of which means that my heart swelled with pride when I opened the jiffy bag yesterday and found their little faces peering up at me. MY GOD IT LOOKS SO GOOD. I hope it does really well for them this Christmas, and even despite my declared bias, I do recommend you buy it. This is not the usual cash-in Christmas crap, I’d tell you if it was (tactfully). It’s a load of fun questions answered in entertaining, informative ways by two very funny, very clever people bringing tons of personality into everything they do. Well done H&O, you made a good thing. This entry was posted on	October 12, 2010 at 10:22 am	and is filed under Uncategorized.